Secondary Ion Mass Spectrometry - Materials Analysis In Golden | Rocky Mountain Laboratories, Inc. Secondary ion mass spectroscopy is operated either in the dynamic mode (DSIMS) or the static mode (SSIMS). DSIMS is useful for profiling impurity and trace elements through films and interfaces. SSIMS is useful for characterizing polymeric materials and only measures the outermost molecular layer of a specimen. In Secondary Ion Mass Spectrometry (SIMS), a solid sample is bombarded with a narrow beam of primary ions that are energetic enough to cause ejection (sputtering) of secondary ions, neutral atoms, electrons, and photons. A mass spectrometer separates the secondary ions, neutral atoms, electrons, and photons. A mass spectrometer separates the secondary ions according to their mass-to-charge ratio (referred to as m/e and expressed in amu) and counts them. The m/e suggests the element or compound based on atomic or molecular weight, and the counts give information about the concentration. Since the sputtering process inherently erodes the sample, dynamic SIMS (DSIMS) provides useful depth profiling data during the analysis. SIMS Analysis can detect every element in the periodic table with detection limits well below the ppm range. It is a destructive technique. In static mode (SSIMS) the analysis depth is one to three monolayers or less than 30 angstroms. There are several types of mass spectrometers used in SIMS. The two most common types in commercially available instruments are the quadrupole mass filter and the time-of-flight (TOF) mass analyzer. Both can be used for SSIMS or DSIMS. The quadrupole operates by applying RF and DC potentials to a set of four rods, which causes the ions to be separated by their mass as they travel through the quadrupole. 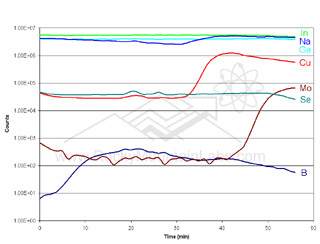 The voltages can be changed quickly which allows relatively rapid scanning of the mass range. Although typically limited to about 1,000 amu, instruments with much higher mass ranges have been built. Quadrupoles have only moderate mass resolution, which generally allows them to separate nominal mass numbers. The TOF analyzers require the primary ion beam to be pulsed prior to striking the sample. The extracted secondary ions travel through a drift tube to the detector. Mass separation is accomplished by noting that ions having different masses take different times to reach the detector, e.g., lighter ions take less time to traverse the drift tube than heavier ions. With this method of mass separation, the entire spectrum can be collected in a few microseconds. TOF’s main advantage is that it can measure masses up to thousands of amu. The primary difference between SSIMS and DSIMS is the rate of sputtering utilized. In SSIMS the objective is to analyze only the top few atomic monolayers of material and to minimize sample damage. This is accomplished with a lower primary beam current and energy The chemical integrity of the surface is maintained during analysis such that whole molecular or characteristic fragment ions are removed from the surface and measured in the mass spectrometer. This provides a chemical rather than elemental characterization of the true surface. SSIMS is often used in conjunction with X-Ray Photoelectron Spectroscopy (XPS or ESCA), which provides chemical bonding information. The two techniques combined can yield a complete picture of the molecular composition of the sample surface. In DSIMS, a focused energetic ion beam is used to sputter material from a specific location on the surface. 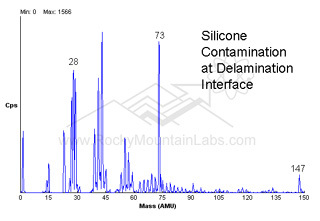 The most common application of DSIMS is depth profiling of elemental dopants and contaminants in materials at trace levels. DSIMS provides little or no chemical or molecular information because of the violent sputtering process. It provides a measurement of the elemental impurity as a function of depth with very low detection limits.